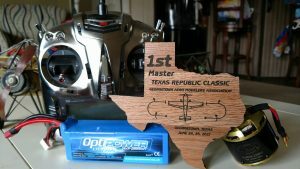 The F3A winner of Texas republic classic Georgetown aero modelers association!! Congratulations to Chuck Hochhalter won the first place of Texas republic classic Georgetown aero modelers association, there were 8 pilots in the class and he won all four rounds to win the contest. His airplane is powered by Scorpion S-5028-220KV (F3A Limited Series).